The powerful Citizen CLP-621 offers unparalleled versatility in the desktop thermal printer class. Printing in 203 dpi in both direct thermal and thermal transfer modes, the CLP-621 features a 360-meter ribbon for g reater productivity and reduced downtime. 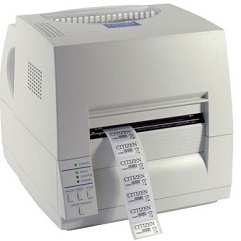 Citizen’s unique metal Hi-Lift mechanism allows easy access for loading of media and/or ribbons and the adjustable media sensor can handle a wide variety of label configurations including standard and pediatric medical wristbands. The powerful on-board 32 Bit RISC processor delivers exceptional throughput and fast first label out. The CLP-621 comes standard with internal parallel, serial, and USB interfaces. Optional Ethernet and Wi-Fi interfaces are also available. • Hi-Lift™ mechanism for easy ribbon and media loading. • Hi-Open™ case for vertical opening and safe closing. • Self-contained metal mechanism for durable operation. • Internal power supply for reliability: no ‘external block’ that can be easily damaged. or Zebra® ZPL-II® • 360 metre ribbon capacity for fewer ribbon changes with Standard 1 inch ribbon cores. • ARCP™ ribbon anti-wrinkle and automatic tensioning system. • Adjustable media sensor as standard with label gap and black mark sensing. • Optional internal Wireless LAN and Ethernet interfaces.